Sergei Korolev was born on January 13, 1966 in Almata, the capital of Kazakhstan, which was then part of the USSR. Like many circus performers of the Soviet era (and even after), he started training in an amateur circus troupe at age eleven in Shymkent, South Kazakhstan. These troupes were the Soviet (and today, Russian) equivalent of European and American Youth Circuses, albeit at a much higher level of skills and training. Sergei showed promising abilities as an acrobat, and he was sent to the State Studio of Circus and Variety Arts of Tashkent, in neighboring Uzbekistan, where he graduated in 1981. From there he joined SoyuzGosTsirk, the USSR’s central Circus organization, for which he performed as an acrobat in a variety of acts from 1982 to 1999—at which point SoyuzGosTsirk had become, after the fall of the Soviet Union, RosGosTsirk, the Russian State Circus Company. Sergei met his wife, Lyudmila, a graduate of Moscow’s State College for Circus and Variety Arts (more widely known as the Moscow Circus School) when they were both working for SoyuzGosTsirk, with which they often toured internationally; they married in 1987 in Moscow. Together, Sergei and Lyudmila have two daughters: Margarita was born in February 1989 in Moscow, and so was Aleksandra (Sasha) on November 27, 2002. In 1997, Sergei, Lyudmila and Margarita went to the Youth Art Center of Rostov, where they built a trapeze and cradlePiece of apparatus (generally aerial) composed of two horizontal parallel bars in which a catcher locks his legs to be in position of catching a flyer. (Variant: Korean Cradle.) act titled Kaleidoscope under the famous circus coach and director, Vladilen Levshin. They began gathering an impressive series of awards, including the Pista de Bronzo at the Gran Premio Internazionale del Circo in Milano, Italy, in 1997; the second prize at the All-Russian Festival of Circus Arts in Yaroslav in 1998; and Gold at the 1998 International Circus Festival of Budapest, Hungary, and the 1998 International Festival of Circus Arts of Warsaw, in Poland. In 1999, the family left RosGosTsirk and began to work independently all over Europe. They were featured at Cirkus Finlandia in Finland, Cirkus Merano in Norway, Circus Conelli and Circus Harlekin in Switzerland, Cyrk Zalewski and Cyrk Korona in Poland, Cascade Kerstcircus in The Netherlands, and Národní Cirkus Original Berousek in the Czech Republic, among other venues. 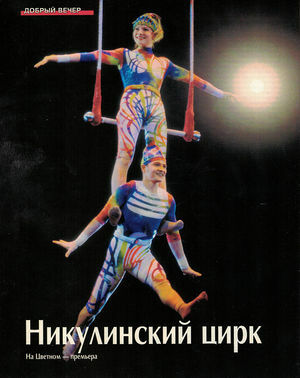 While they were with Cyrk Korona in 2008, Sergei began building a hand-to-handAn acrobatic act in which one or more acrobats do hand-balancing in the hands of an under-stander. balancing act with his daughter Sasha, who was then six-year old. They also participated in television shows such as Poland’s Got Talent in 2009 and 2010. That same year (2010) they won the Grand Prix (trapeze duo) and the Gold Crown (hand-to-handAn acrobatic act in which one or more acrobats do hand-balancing in the hands of an under-stander. act with Sasha) in the International Festival of Circus Arts in Warsaw. In 2013, Lyudmila, Sasha and Sergei went to the United States, where they have been featured in Neil Goldberg’s Cirque Dreams, with which they have toured extensively in North America. Sergei and Sasha have also performed at the Ringling Theatre’s Circus Spectacular in Sarasota, Florida, in NBC Television’s America’s Got Talent, and in several NBA’s half-time performances with their hand-to-handAn acrobatic act in which one or more acrobats do hand-balancing in the hands of an under-stander. acrobatic act. In 2016, they were invited to participate in the International Youth Festival of Circus Arts at Circus Nikulin in Moscow.